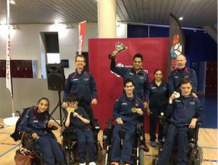 Recently, Pace Boccia were crowned the National League champions. It is the biggest achievement in Pace’s history (so far…) so I thought it would be fitting to look back and remember the key events that helped us become National League Champions. Let’s take a look back at some highlights that got us to where we are today! PACE Charitable Trust was formed in 2004 with the goal of delivering sport and leisure activities to young disabled people. When PACE started it was a small group of close friends and one of the sports was proposed was Boccia, along with cricket and volleyball. A few years passed, PACE had grown bigger and in 2006, PACE won the Club of the Year, awarded by Don Taylor, who broke the world record for the 10,000m in 1963. It was also the year that I joined. Coincidence? 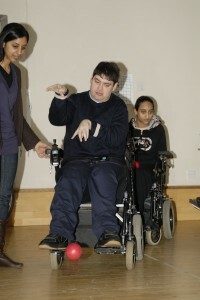 I think not… Anyway, Boccia was still being played and members their skill had improved. So in 2008, PACE founder Krishna Birdy took a small group of people up to the Boccia England regional competition in Farnborough to show the sport being played in a competitive setting. I remember taking a small group up to Farnborough, and I hired a mini-bus to take us there. It was the first competition that we all have been to. At the time Boccia at PACE was still considered to be a light-hearted activity and I wanted to show them that it can be taken further if you want to. I think it was a turning point for many of our members”. Thus PACE Boccia was born! At the start, the squad was entirely made up of PACE members. Naturally, the team didn’t have experience of playing boccia in a competitive setting. That being said, the experience gained from competing in the National League was invaluable and a few athletes who competed in 2008, including Arti Dasani and Jagjit Chuk, still play today. Two years later, in 2010 Michael Forrest became the first PACE Athlete to qualify from the regional competition into the National Finals, in the BC1 classification. It took him five years of training to reach this stage, and he went on to finish third in the National Finals. This was the first national level medal for PACE Boccia and proved its mandate of giving opportunities to disabled people in a competitive space. Unfortunately, Michael no longer attends PACE boccia but he still plays accesses boccia with PACE through the On Your Marks project. In 2011, due to PACE Boccias’ continued success, PACE was invited to attend an event highlighting one year before the 2012 paralympic games. PACE demonstrated boccia and even had a game on Trafalgar square with the London Mayor (at the time) Boris Johnson. Alex and Sunil were selected as London 2012 Paralympic flame bearers for Ealing, due to their contributions to community sport, they were also invited to the opening ceremony in Trafalgar Square where they got to meet the Prime Minister David Cameron (at the time). As part of the ceremony, Alex and Sunil took the Paralympic flame up Northalla fields in a spectacle of light and sound, which was observed by over 2000 people. This event was a special one for me, as a local resident. To get the chance to represent Ealing and London for the Olympics was a proud moment and something that I will always cherish. With all the attention of the Paralympics and sport in general PACE Boccia continued to grow. Jamie Keat, our youngest athlete joined us for the 2012/13. At the time Jamie was 7 years old and had never played a competitive sport. 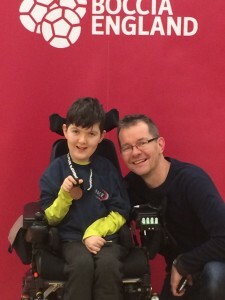 Jamie is BC 3 player and has competed regionally for the past five years, claiming one bronze medal. Advancements in his game and training with high-quality team-mates have seen Jamie develop to become a critical player for the senior team, aged just 11. With the success of the London Paralympics, PACE was inspired, and worked towards taking PACE Boccia to the next level. Sunil Birdy was recruited as Head Coach of PACE Boccia and Andrea Zemenides as an assistant coach in 2013/14 season. 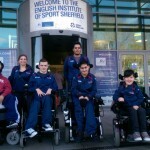 In the same year, Sunil’s input saw PACE Boccia being split into two teams A and B, allowing more competitive opportunities for athletes on the fringes of the squad. Following trials and assessments, Alex Dukes was selected to become captain of the A’s and Hitesh was selected to become captain of the B Team. Trials for athletes were conducted to place them into the right team, whilst selection criteria was also introduced. This kept all of the athletes on their toes. We now know there’s competition for places, we now know which way the club was heading, most importantly, all of the athletes were now to be held accountable for their actions. Codes of conduct were drawn up, membership fees introduced and the coaches developed clear, progressive and fun session plans that were engaging for all. 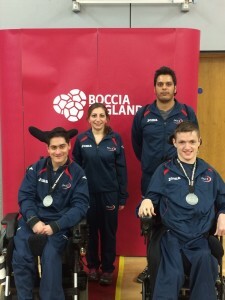 In 2014/15 season, Reshad and I medalled at the National Finals and qualified for GB Championships, the pinnacle of boccia competition in Great Britain. Reshad was placed 6th and I finished 2nd, with both achievements being a combination of work and commitment from both the athletes and the coaches that supported them. This was our first major success of the “new-look” PACE boccia and it came within a year of the shakeup. 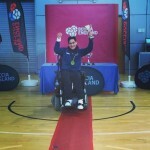 Sunil’s efforts were recognised by Boccia England, and earned him a call up at the start of the season to take a lead on the England Lions BC4 squad. PACE Boccia also achieved an important milestone coming 1st in the London League in May and qualified for the National League Finals for the first time ever. The National League Finals took place in July where we finished 11th. It was a tough competition against really powerful opponents. We never got off the ground, yet the experience gained from this definitely helped us in the years to come. Later in the same year, the PACE Panthers team made up of Reshad and Ramandeep, captained by Alex, won the teams and pairs competition in November. This was the first team medal that PACE had achieved under the new system. I don’t really remember the competition all too well with it being a couple of years ago…However, I do remember the final, I played a really crucial shot under pressure to score a point against opponents with international and paralympic experience. This shot sealed the win and the trophy for PACE Panthers, sending Sunil into raptures on the sidelines. The PACE Panthers win Teams and Pairs 2014!! In the 2015/16 season, five PACE athletes qualified for the National Finals, Alex, Jagjit, Jamie, Ramandeep and Reshad. Alex (bronze) and Reshad (gold) both medalled at the Nationals and qualified for the GB Championships in May. Unfortunately, Reshad finished 8th and Alex couldn’t attend due to personal reasons. Despite this, Reshad was able to play strongly and consistently through the season and secure himself an international call-up, the first PACE athlete to be selected for England. In May PACE A win the London League for the second time, however are unable to build on the 11th placed finish in the National league finals. PACE B finished 2nd in the London League. The 2016/17 season must be our most successful and exciting year yet for PACE Boccia. 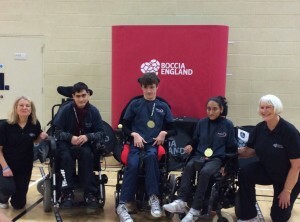 With the success of winning Gold, Reshad was then selected to represent the England Boccia team and went on to claim another gold at his first international competition, in Poland. A big thank you too all my coaches and my parents for giving me the drive and motivation to achieve this. Winning Gold was a personal goal for me”. In November PACE B took on a new athletes, Mitchell and Aiden Robinson, Janki Dasani, Savraj Sehra and Anton Walton. As our memberships were increasing, PACE asked me (Alex) to take a greater role in supporting sessions and coaching boccia, so I decided to further develop my skills as a coach, gained a level 1 coaching qualification and have been building my coaching experience as part of a strong coaching team. 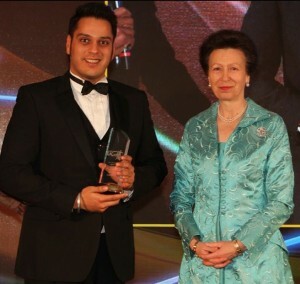 At the End of the year Sunil was recognised for his work with PACE, being awarded the Sportscoach UK “Community Coach of the Year” award by Princess Anne. The main reason he won this award was because of his commitment and contribution to developing boccia and raising participation in London. I’m really delighted by this and grateful for all the support and encouragement I’ve received. As a coach I’m keen to represent all athletes regardless of their background, of course I need a platform to do this, so thank you to PACE”. In January 2017, I was recruited by PACE as an intern, thanks to the ‘Time to Shine scheme. This role saw me take on more coaching responsibility and producing amazing media and promotional content for the PACE website such as the blogs and articles etc. Due to his commitment and continued success within boccia, Reshad also won the Boccia “Athlete of the year” award for 2016/17. A new arrival joined PACE in June, Ali who accessed boccia through Southall college, where PACE delivered a six – week programme. He loved it so much that he’s decided to join the team! In July 2017, PACE attended the National League finals. As you probably already know, PACE A won the London League for the third year in a row and qualified for the National League. To be honest, heading into the National League, I wasn’t expecting much. I know that sounds bad but, over the last two years, we have finished 11th and 13th. Personally, I would’ve been happy with a top ten finish. Knowing the PACE ethos, my teammates and coaches, we always give our 100%. However, nothing could have prepared us for this competition. We played six matches, over ten hours with few to no breaks. In hindsight, the hectic schedule helped us keep our concentration and performance levels up and where it needed to be. I won’t go into detail of what happened as there is the article on the League Finals. Spoiler alert… we won! “I’m extremely proud of the team for their hard work and determination throughout the competition. It was a pleasure to watch them play so well as a team, working together and complementing each other’s skills. We weren’t expecting to medal but the team thoroughly deserved their success”. “I am delighted that we were able to work so well together as a team. My new ramp really gave me great confidence to go for long shots I wouldn’t have tried before. It was a tense, nerve-wracking and thrilling day, which I’ll never forget”. “I’m really happy with the gold medal. I’m glad that I could help my team out and win us the tournament”. “I’m so proud of how everyone did. The shots just kept coming (as far as I could tell from my view away from the court). The knock out games were all really close, with fractions of a millimetre between success and going out, but each time it fell our way. I don’t think it was luck, though, if you are playing well enough, you end up in those situations! Ten hours sitting on a small stool looking away from the action barely moving was never so enjoyable. It’s amazing to think back to where Jamie was with his game three or four years ago compared to now, and the rest of the team have followed suit. My favourite shot was Ramandeep’s ice cool winner after waiting for a long day to play it”. As we head into the summer break, you would think PACE would do the same. That’s not the case however, we have the pace4PACE fun coming up very soon, and into August we have the GB Championships in Liverpool. Then after a short break, the new league season start, with PACE A being promoted into the Superleague and PACE B looking to win the London League for the first time. The 2017/18 season promises to be an amazing season. An inspiring journey for PACE Boccia. Well done to all the players and coaches. Here’s looking forward to the 2017 – 2018 season!